Just a little over a week until Christmas, and this weekend was cookie weekend! To be honest I try making the whole holiday experience pretty low stress. I pick one craft to work on with the girls along with school gifts for teachers, and then one holiday treat. It gives us one or two things each weekend to work on and keeps me sane and able to enjoy the season with my family. 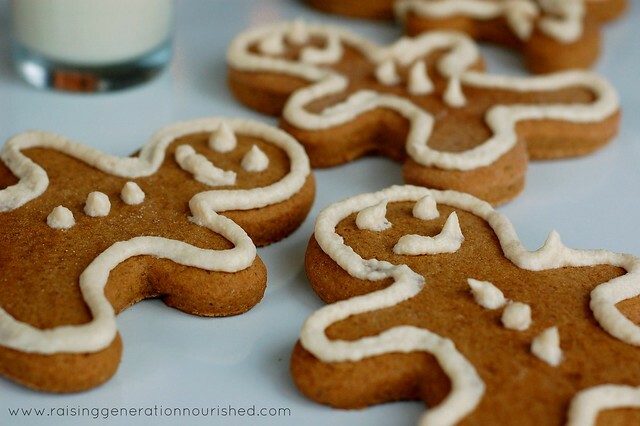 This year we decided on gingerbread cookies! As the girls get older, this Christmas baking thing gets so much more fun. My 3 year old was much more into it this year, although had some good patience training waiting for them to cook, cool, and frost! 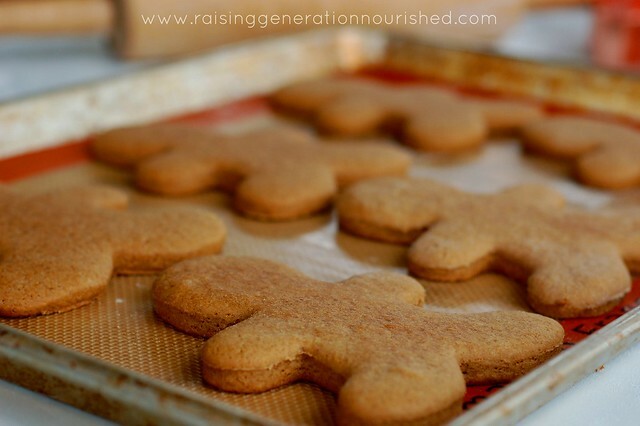 The gingerbread dough itself is super easy to work with, and very forgiving. If you served these at a party or gathering I don’t think people would even know they were gluten free! We frost our cookies with buttercream frosting…because that’s just how we roll! You can frost however you wish – I was pretty impressed with my 5 year old’s frosting skills this year! You could also bake in nuts or dried fruit if you want to go without the frosting. The girls are pretty excited about leaving that big glass of milk and a gingerbread cookie for Santa next week! These are easy to make and you'll love to have a traditional recipe at the ready for your gluten-free guests. Cream the butter, molasses, and sugar with hand beaters. Add the egg and beat through. 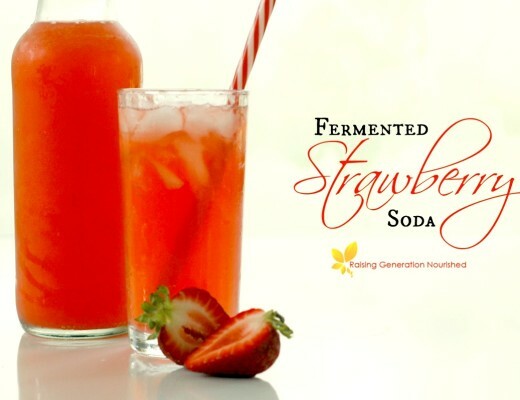 Add the rest of the ingredients and combine – I start out with a spatula and finish it off with hand beaters to really get it all combined well. Let the dough chill for an hour in the fridge – I split the dough up into 2 disks so it chills faster. 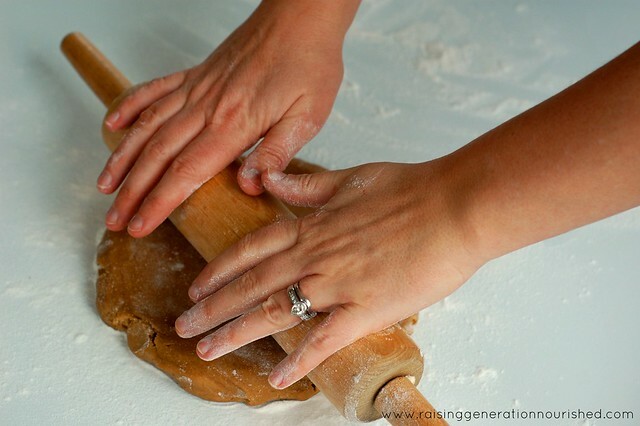 Knead the dough with your warm hands to make it pliable, roll out onto a rice floured surface, cut out your shapes, and place the shapes onto a silpat lined or parchment paper lined baking sheet. Cream all of the frosting ingredients together until well combined. You can frost your cookies once they have cooled! Product links in this section are affiliate links. It does not cost you anything and helps maintain the free information on this site! Please know I would never personally recommend any product I wouldn’t use on my own family. This batch makes 18 large gingerbread cookies. We will enjoy them with family at our family Christmas party next weekend, and leave one or two for “Santa” and “Mrs. Clause” on Christmas Eve 😉 The girls enjoyed one today while we decorated too. I’m a big believer in not going overboard on the sweets around the holidays so the girls’ immune systems stay as healthy as possible. You can make the dough up ahead of time if it helps with working this all in with the kids. Sometimes it is hard for them to wait for the chilling part! I did have my 5 year old help me make the dough this year though. Play around with the spices to your taste! These are pretty mild in my opinion but we love them and they aren’t too overpowering on the ginger. 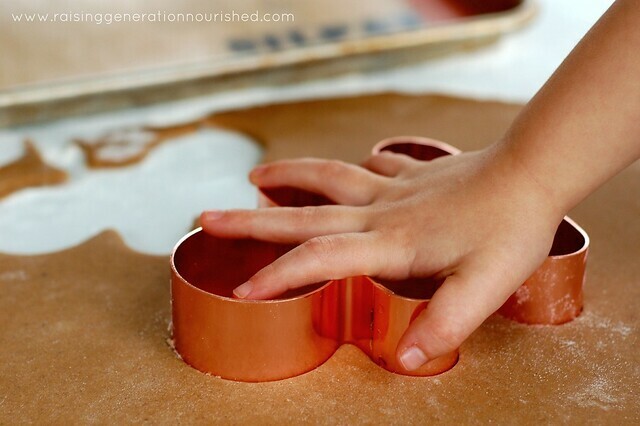 Here is a great sturdy gingerbread cookie cutter if you are looking for nice one that will last and be able to use with grandchildren in the years to come! Baking on Silpat is so nice! No sticking, and much easier clean up – I have a couple sheets so I can get two pans going! Here are some great gluten free thumbprint cookies if you are shorter on time – they are so simple and quick! This post was shared at Real Food Wednesday & Allergy Free Wednesday! 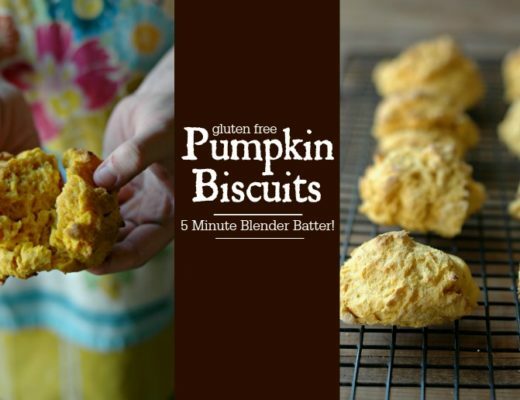 Gluten Free Pumpkin Biscuits :: Easy, 5 Minute Blender Batter! This is JUST what I was looking for!!! I will be trying to make these but also dairy free too! Any tips on a dairy free version? Hi Lauren! Great! Yep you can sub coconut oil, palm shortening, or pastured lard for the butter in the cookie and that should work great! And then for the frosting you can use palm shortening instead of the butter – palm is a great source of friendly fats and you should be able to find it in any health food store – probably even some mainstream stores. In the baking sections most likely. 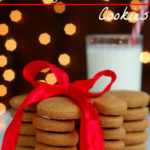 what is xanthan gum and why add it to your cookies? If I were to use a gluten-free all purpose flour mix that contained the tapioca flour, the rice flours and the xanthan gum, how much should I use here? Hi Angela! If you just equal the flour amount – so 3 1/2 cups of flour I think you should be good – and then leave out the xanthan gum since it is in the mix you have. Does that make sense? Have you tried making them with GF oat flour? I just don’t like using tapioca. I LOVE your pictures. Thank you Anna! I have not tried it with oat flour and it will probably change the dough quite a bit – tapioca flour gives a soft, gluten-y type texture. I’m not quite sure what oat flour would do. I’m sorry that doesn’t help much! 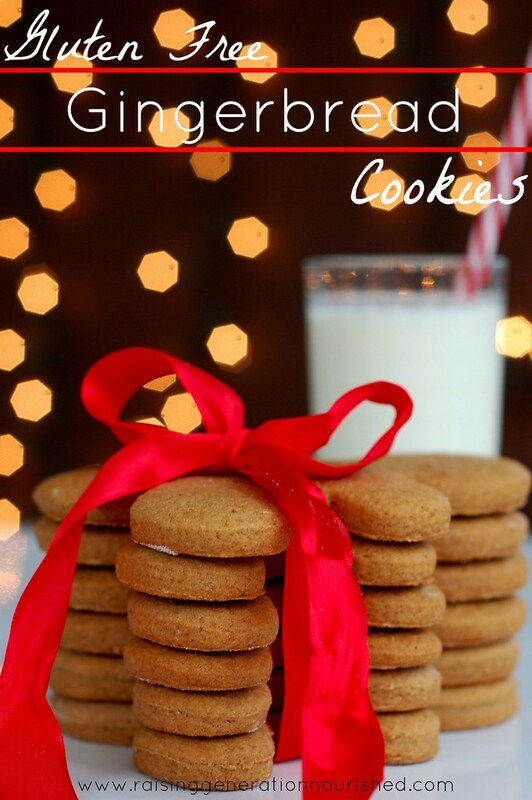 I am looking forward to making these cookies for a Christmas party! About how many round cookies would you say this makes? Hi Kristen! It would depend on how big your rounds are – this batch makes 18 large gingerbread men cutouts so I would say double that number with a small/medium circle. I hope that helps! I made these yesterday for my daughters class party today. I used flax eggs im place of the egg and they turned out great! Hi Amy! Oh! I was thinking of you when I posted this hoping you would try an egg free version 🙂 I’m glad they turned out! That is so great! Thank you for coming back to let me know! I know I’m very late but if I’m using a gluten free flour blend, what would be the exact measurement for that? Hi Ashley! Yes, I used the Namaste Gluten Free Flour Blend exact measurement for the flours, and just left the xanthan gum out because the blend had xanthan in it and they worked out great! I like your philosophy of keeping things simple at Christmas and choosing one thing to bake. It’s important to be able to relax and enjoy spending time with family. It must be fun for your children to help you with these cookies! And, the cookies look great! Omg these are soooo cute and festive! 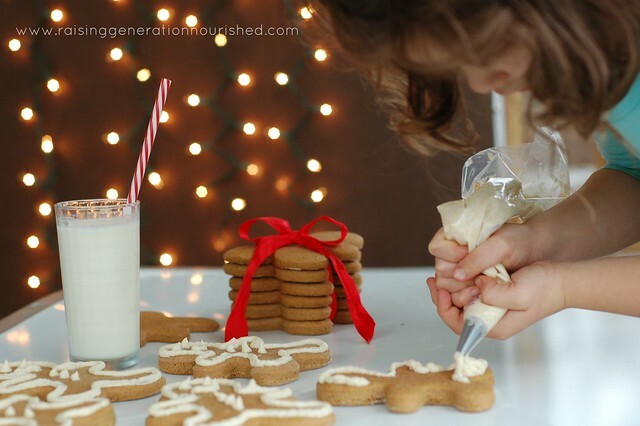 Saving this recipe to make with my niece for christmas! YES!!! 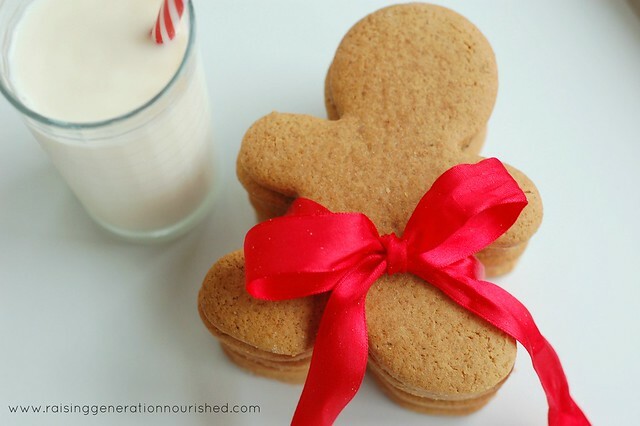 NOW this is a GOOD Gingerbread cookie recipe! I will be trying this recipe soon. It’s not the holidays without them. Will this recipe work for a small gingerbread house? I don’t want the hard tasteless recipes I’ve seen on the internet. Hi Miriam! Yes it does!